Today we present the case of a patient who consulted us having been referred by the orthodontist after orthodontic treatment. She presented with a recession in the central lower right incisor as well as a high frenal attachment. 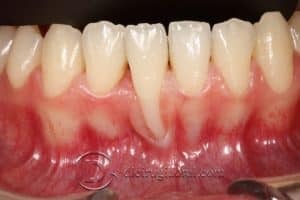 The patient had a very fine gingival biotype that went as far as to cause transparency in the roots of neighbouring teeth. We made a tunnel access and grafted using connective tissue taken from the palate. In this patient’s case, we obtained very limited connective tissue with a high predominance of fatty tissue. Once the graft was performed, we oberved that it had covered part of the recession but not all of it. Subsequently, we decided to wait 4 months and regraft using the same technique, but this time adding a frenectomy. You can observe the state of the second graft after 15 days and after 5 months.